What Happens When You Hold A Sneeze? In certain scenarios, like when you're on busy public transport, or doing an intense work presentation, it can feel kind of awkward needing to do a big old sneeze. So sometimes, we hold them in. But have you ever actually thought about what this might do to our bodies? Given that sneezes are pretty powerful, LifeHacker explains that humans can sneeze at up to 40 miles per hour, travelling to distances of up to 30 feet (that's kind of gross when you think about it); you'd think there'd be some kind of repercussion for not letting the damn things out. Like, where does it go? Luckily, we're here to reassure you (well, otolaryngologist Dr. Dale Tylor is, in actual fact). 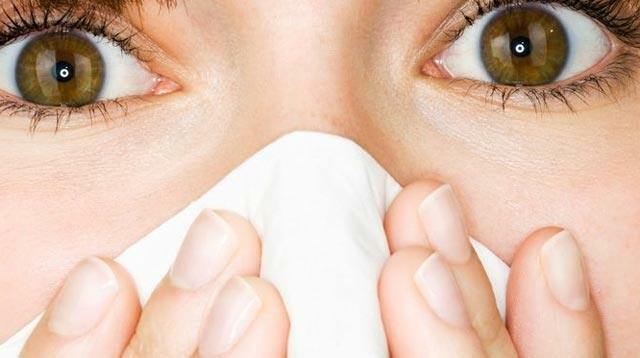 Because although a lost sneeze can actually do some damage your body (meaning it's not exactly advisable), it's not going to do any serious harm, either. Dr Tylor told Digg about some of the risks of holding in a sneeze: "There can be a risk of injury if there is a violent sneeze, with air pushing into the region of the orbit or brain," the doctor explained. The pressure of the sneeze, he says, could redirect into your sinuses and skull as opposed to exiting out of your nose and mouth, meaning "you can get small gaps in the bone separating the nose and eyes or nose and brain." Luckily, Dr Tylor reassured Digg these "will heal on their own." And just in case you were worried about the pressure maybe popping your eyeballs out their sockets or something gross like that, that's not going to happen. There's slightly more chance of you rupturing an eardrum or popping a blood vessel in your eye if it's a particularly aggressive sneeze you're holding in, but the doctor says this is still "very, very uncommon." So basically, sneeze or don't sneeze. Either way, you're gonna be okay.